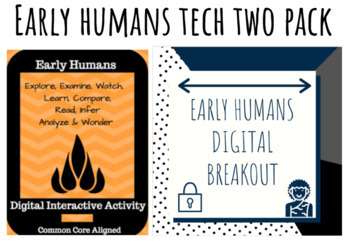 This product contains and Early Humans Digital Breakout and Hyperdoc. Items also sold separately. 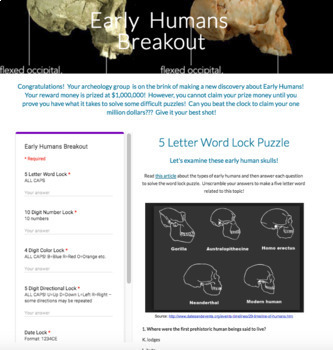 Looking for a digital breakout covering Early Humans? If so, then this is the document for you! All you need is connection to the internet! This breakout is on a Google site. Part of my mini Ancient Civilizations Digital Breakout Bundle. Part of my complete Ancient Civilizations Breakout Bundle. Congratulations! Your archeology group is on the brink of making a new discovery about Early Humans! Your reward money is prized at $1,000,000! However, you cannot claim your prize money until you prove you have what it takes to solve some difficult puzzles! Can you beat the clock to claim your one million dollars??? Give it your best shot! You may also be interested in my Ancient Greece Breakout, Ancient Rome Breakout, Ancient Egypt Breakout,Ancient India Breakout, Ancient China, or Mesopotamia Breakout. Are you looking for a way to make a topic more engaging, technological, and interactive? Well, then this is the product for you! 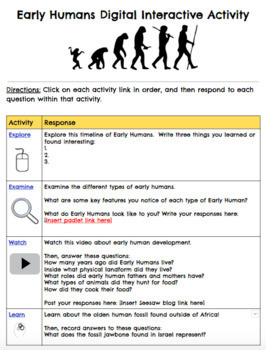 100% digital, this doc can be used to introduce or reinforce the study of Early Humans. 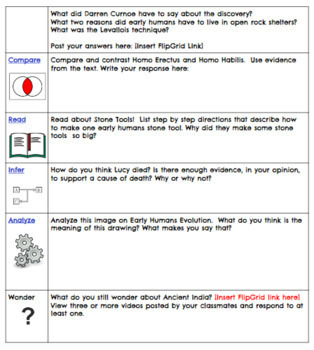 Product includes the link to the doc site and embedded within is a tracking sheet for each student to record their responses to each question. Must have internet access. Doc is web-based. Video link is from YouTube. It may be blocked by school filter. If so, show the video whole class. Links to Padlet, FlipGrid, and/or Answer Garden may need to be created for some activities. Be sure your school district gives students access to documents from outside of your school district.